We've been driving piling for nearly 100 years! 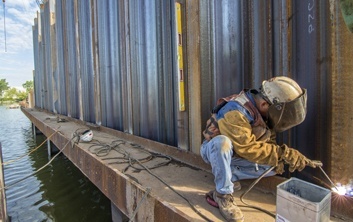 Since Brennan began in the early 1900s we have been building pile driven deep foundation structures to support electrical towers, buildings, bridges, and more. We have a fleet of specialty equipment that enables us to gain access to remote locations and water-based environments. 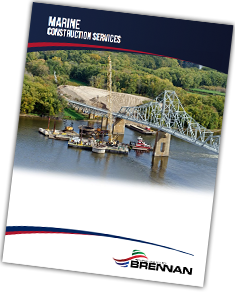 This ability makes Brennan the ideal contractor to build bulkheads, cellular structures, Open Cell™ structures, cofferdams, bridge abutments, and more. We work closely with our clients and engineers to provide a long lasting foundation system that will transmit loads to deeper, more stable soils and rock. Our crews have the experience to work in low-clearance situations such as under highways, railroad bridges, or even power lines. We use a variety of tools, chosen to best fit each project. At Brennan we have a variety of vibratory hammers and diesel hammers, and have several types and sizes of excavators and cranes that will ensure we achieve the designated bearing capacity. Want more information on our pile driving services? Please fill out the form below!